Designed to roam through the rural regions of the Netherlands and follow the various harvests throughout the year, the Buijtenkitchen packs everything a seasoned chef could need to prepare sumptuous meals away from their home kitchen. So if you're tired of slaving over a tiny propane-powered grill when camping, maybe it's time to consider building one of these. 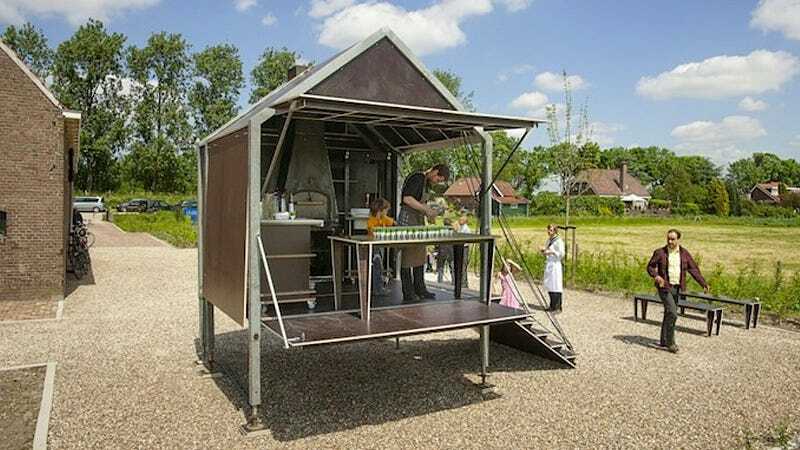 The Buijtenkitchen isn't designed to collapse and fold down like a pop-up camper, but everything inside can be secured and strapped down so it arrives in one piece when towed to its next destination. And besides a built-in wood-burning oven, a large water reservoir, and ample counter space, the kitchen's best asset is constant access to incredibly fresh ingredients since it's able to set up shop wherever vegetables are ripe for harvest.